***Send Owner an Email with description of group. *** E-MAIL (from the contact owner section), to quickly get the most accurate open dates and rates. WiFi Internet connectivity is provided. Unassuming and relaxed elegance. Swim right off the dock or off Sea Oats Beach just out the front gate. All is good here after 2017 hurricane season. Great deep dockage and quick access to bay and ocean!!! Just a short walk away from wholesale stone crabs and lobster! Beer also! Beach & Bay Bungalow. This home has it all. New HD 65" television and high speed wireless interntet included. All bedrooms have flat screen television. Spectacular long water views from inside and out of this secluded property! The only thing more beautiful than the view is the large dock. The dockage is deep and can accommodate large deep draft boats. There is plenty of room for multiple boats. Electric, water and light are conveniently located at the dock. The home is located in the middle of a large private peninsula and is well hidden from view from any road. The mile long beach is just across from the front entry gate. The property has a gated 450 foot driveway just off the middle of Sea Oats Beach. The dock is right out the back door. The home is on the bayside and very close to Channel five and Indian Key channel. It is all very private. One enters this paradise through a gate from US-1 right across from one of the best wade fishing flats (bone fish, tarpon, and snook) and best beaches in all the Keys (Sea Oats Beach). Private drive leads to your secluded upscale paradise. The home has a round mahogany door that is your entry to a comfortable and open 3 bedroom, 2 bath home. The kitchen is large and fully equipped with everything you need for a comfortable stay. The kitchen opens up to the dining and living area where there is a beautiful coral wall with flat screen TV for you to enjoy. All bedrooms have flat screen televisions. One of the most wonderful features of the home is an oversized vaulted ceiling screened porch with excellent open water views from 2 sides and a tropical garden view from the third side. See the sparkling clear water from a great vantage point while enjoying cocktails with your friends. Sit back . . . relax . . . and breathe in the beauty of the warm ocean breeze as you await the arrival of a fresh catch for the evening's dinner. When the boat arrives the passengers may take a dip in the clean water to cool off and can shower as they step out of the water onto dry land. The fishing is phenomenal in this area - both bay and ocean are instant access. The bridges and reefs are very close by. Needless to say, the options are endless. The home has several balconies and sitting areas in the lush tropical landscaped front yard and overlooking the water in the back. The sleeping accommodations should easily meet your needs - there is a king in the master. The master has a private balcony with an open water view and jetted Jacuzzi tub. One of the guest bedrooms has 2 queen size beds and is perfect for a family. The other has a queen size bed. All bedrooms are equipped with flat screen TV's. You will absolutely love this charming home that captures the spirit of the Keys. It is a place that will create many wonderful memories for you, your family and friends. We welcome you to our home. Stay for a month, stay for six months! You won't want to leave! We love to fish and just be around the water. I know you will love the great views and wonderful dockage at my home. We enjoy sharing it with responsible families. We have created many great memories at this home and I know you will also. Be sure to send an email to get up to date rates, availability and information about the home! We fell in love with this spot because the views are unbelievable. Also the location provides easy access to all our favorite spots for fishing, diving, swimming and dinning! Can't be beat. The charm of this home is its privacy, great dockage, beautiful views, crystal clear deep water and the beach out the front gate. Unassuming relaxed elegance. So much nature right outside the home. Luxury inside and natural beauty outside. Just a great place to have an extended stay of 28 days or more. Nice long beach just out the front gate! Fantastic deep direct access dockage. Easy to navigate to the bay or reef. Just across from Sea Oats Beach. Peek through the lush vegetation and view the Atlantic Ocean from the front of the property! Wonderful long water views of the large secluded cove! 65" HD TV, Sofa and two love seats. Best to bring all spices, condiments and paper goods. Many options for boat rentals in the area. Kayaks, center consul, inshore, offshore, small and large all available to rent and keep at our wonderful dock. Just returned from a great stay at this property!Like my title says its a hidden gem for sportsman, Although I would recommend it to any vacationer that likes a little seclusion as its tucked back off the road to offer a good bit of privacy. This property was clean and well maintained, Chris the owner was really easy to get messages to and responses back quickly. I'm a long time Key's vacationer and have rented a bunch of homes in the area, and I thought this home to be a good value with a lot of little things that make for a good vacation. My group of 4 large guys found the large beds very comfortable, it has a really large screened in porch for a great sitting/eating/cocktail area, with a great view of the basin area and some good ocean views looking towards the east. There was plenty of parking and great storage under the house for all the stuff you bring on vacation and never use, (for us it was mostly a back country fishing vacation , so we stored a bunch of gear an extra trolling motor, pinfish traps a bicycle and tons of other stuff, it was great piece of mind to have a safe area for stuff like that with easy dock access, this area would be perfect storage for a dive vacation to dry wet gear and get ready for your next trip in the shade) Also a good sized bait/fish freezer down there. The dock has great water pressure and electrical outlets with a good sized cleaning table, and deep water from the dock all the way out to the ocean, I would say you could easily keep a large twin outboard boat or medium size inboard boat there with no worries about hitting bottom getting in or out of the basin. 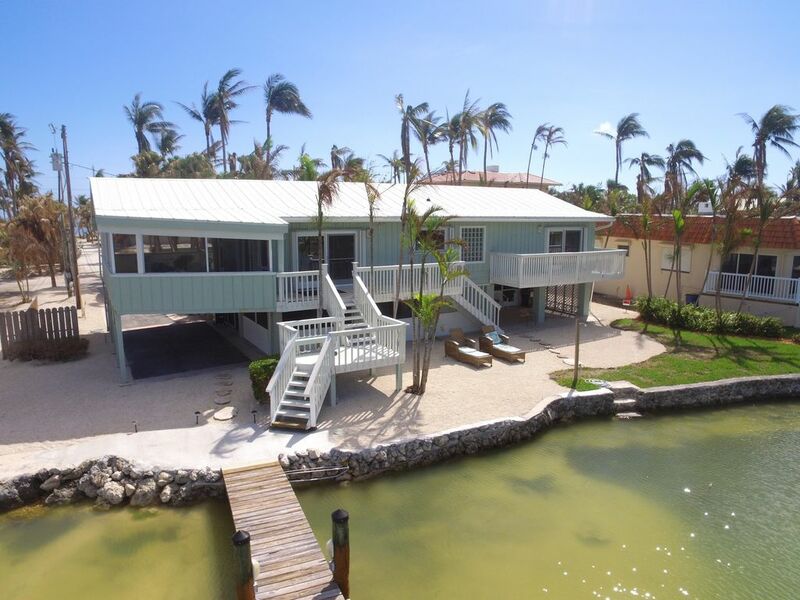 This home really had a great feel to it, it captures the essence of the keys well, we saw a lot of small and large birds a few iguana's and had a nice visit from a large manatee while we cleaned fish! Everybody in my group agreed that it was just far enough out of town to enjoy the seclusion of the area but not so far you couldn't get what you needed quickly. Many times its tough to get a feel through pictures and descriptions for a rental home, Truly this home has a great balance of location, Tranquility, ocean and bay access and creature comforts needed to have a great vacation.....we'll definitely be back!!! The house was great! Beautiful view and enough room for the family. Loved every minute of our stay. Our family just got back from an Amazing trip staying at Chris's home!! This was our first trip to the Keys and we are already talking about re-booking for next year. The pictures don't give you the whole picture of this property. The entire side of the house is a Huge screen porch that looks all the way out towards the Gulf without any other homes in the way. We brought our 28' foot boat with us and there was plenty of room to park it at the dock and our trailer we backed in under the house. We launched the boat a few miles past the home at Seabird Marina. It was a nice Marina and big enough for our boat. They also have bait, ice, beer etc.. There is a little side street running parallel to the main highway that we were able to pull off on until we backed the trailer in all the way down their driveway and it was easy to get it under the house. The inside of the house was adorable and had everything we needed to feel comfortable. A Publix just opened there last week and is about 8 miles back in Islamorada. The outside of the house was great for chilling out. Our children fished and had a blast with the casting net catching all kinds of things. Lower Matacumbe was just the right speed for our family. It is much smaller than some of the bigger keys and has a few restaurants but is literally 2 miles back to a much busier Islamorada. Our favorite place to eat by car was Pierre's and The Beach Cafe at Morada Bay. They share the same beautiful gulf front beach. Pierre's is pricey and fine dining and The Beach Cafe is the laid back side. The grounds are absolutely lovely!! Our favorite place by boat was Hog Heaven on the Atlantic side. We ate here several days after snorkeling around Cheeca Rocks and the Lighthouse. The lighthouse was amazing! SO many fish!! We found a great underwater sandbar that was a local hangout just out from the house and around the front. There were tons of boats anchored there and all the people stood out in the water enjoying themselves. The kids could stand and throw the ball. That was lots of fun!! We had so much fun and fell in love with the Keys! We can't wait to go back!! Chris's house is clean, well maintained and offers plenty of space including a great screened in porch. We fished from the dock each morning and caught sharks, a stingray and watched a manatee. Chris was very helpful and had completed some repairs after the hurricane. It appeared the Keys fared better than the news channels portrayed. I would recommend his place to anyone and appreciate his excellent customer service. Our group rented a fishing charter and traveled to Key West and had a great time there as well. My family recently stayed here and we all had a wonderful vacation. The house is gorgeous and very clean and comfortable. We all loved the outdoor space porch and tiki hut to enjoy the breeze and beautiful scenery. We also all caught plenty of fish right off the dock out back. We rented a deck boat for 2 days and were able to bring it to the house and docked it there for the second day. That was a convenience we enjoyed. The neighborhood is quite and well kept. Everything is in good working order at the house and Chris was always very prompt in answering emails or phone calls when I was inquiring about the rental. Another plus is that there are plenty of dishes, cooking utensils, and pots/pans in the kitchen for cooking and meal times. We all enjoyed ourselves thoroughly and are hopeful to have another family vacation there next year! My family stayed here over Winter Break and had a great time. The house is beautiful and in a lovely spot, well away from the road. Very private and felt like we had our own oasis during our stay. The canal the home is located on is clean and gorgeous with easy access out to the Gulf/Bay side. My kids kayaked and paddle boarded everyday and if we had our snorkel gear, they would have done that as well. Easy access to the canal and there is a dock to fish off or park your boat if you have one. Lots of wildlife to see. Sea Oats beach across the road isn't the best beach for playing in as it is very mucky but it is good for collecting shells and putting kayaks into but don't try wading. The home is as described and Chris was prompt in answering all my questions. Had a great time and we look forward to returning! The fishing is wonderful in this area - Easy access to Bay and Ocean! Bridges and reefs are very close by. The options are endless. The home has several balconies and sitting areas with views of the lush tropical landscape and overlooking the crystal clear water!